Signing up for Account Bill allows you to receive one monthly invoice for two or more Quincy Mutual policies. Complete this form and send it to us to enroll. Are there a minimum/maximum number of policies for enrollment in Account Bill? Account bill requires a minimum of two policies and a maximum of five. When can I enroll in Account Bill? You can enroll in account bill anytime. However, any outstanding invoices must be paid at the time of enrollment. Can you select your due date? What is the default due date? Yes, you can select any due day of the month 1st – 31st. If selecting 29th,30th or 31st, and that date does not exist in the month due, the due date will be the 1st of the following month. If no date is selected, the default is the effective day of your Primary Policy. Example: Primary policy HP 123456 policy effective 1/5/2010 – the due date would default to the 5th of the month. How is the number of installments determined on Account Bill? Customers who accept the default day of the month (see #3 above) will be billed in ten installments. Customers who choose the day of the month the payment will be due will have nine installments. How is the Minimum Due calculated? The minimum due is the policy balance divided by the number of installments remaining. What is the purpose of a Primary Policy? It determines the billing method – Standard Invoice or EFT. It is assessed the statement service charge (no service charge for EFT accounts on E-Bill, $2 service charge for EFT accounts that receive paper notices). It provides the mailing address. It will determine the due date if none is selected. What is my Account Bill Number? It is issued at time of enrollment and consolidates the billing of all policies. It can be found at the top right portion of your Account Bill statement and will begin with ANP followed by six numeric digits. Can I change the due date? Yes, but the most recent account bill statement must be paid in order to make a change. 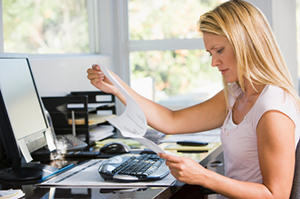 What are the Payment Options for Account Bill? Mail a check to Quincy Mutual – write your account bill number on the check. Online – go to quincymutual.com and use the “ Pay Your Bill” button. EFT - Prior enrollment is necessary. What if I cannot make the minimum payment due? If the minimum amount requested is not received by the due date, you may be unenrolled from account bill, and a cancellation notice may be issued in accordance with the applicable state law. Separate notices will be sent for each policy. The Company will determine how the payment will be applied to your policies for payments other than the minimum or full due from the invoice. Are there installment service charges? There is a five dollar ($5.00) service charge per statement billing, two dollar ($2.00) service charge per statement billing for EFT accounts that receive paper notice, or no service charge for EFT accounts on E-Bill. Do all policies need to be with the same agent? Can I sign up if I am Premium Financed? Are Massachusetts Auto Insurance Plan (MAIP) policies eligible for Account Bill? What if my policy premium changes? Adjustments to the premium will be spread evenly over the remaining installments on a policy term (year). An overpayment on an Account Bill policy will be applied to other policies on the Account that have a balance due. Contact your agent to request a refund check. What happens if a policy or policies are removed from Account Bill? When removed from Account Bill, billing for the individual policy will resume under the pre-existing payment plan. For policies that are removed for non-payment of premium, this may result in a large minimum payment due on a Cancellation Notice. I am currently an EFT customer, what changes should I expect? By enrolling in Account Bill you will have only one EFT withdrawal taken for all policies on Account Bill. The reference on your bank statement will be your Account Bill number. The number of installments will be reduced, making your monthly premium payment higher. You will have the option of selecting your due date. Can my agent enroll me in Account Bill? You can contact your agent for enrollment or other policy changes.